MANILA, Philippines - OPPO F1 Plus, dubbed as the 'bigger, better Selfie Expert' was officially launched on Saturday, April 16 at the Shangri-La The Fort in Bonifacio Global City. The second device after the F1 in the camera-centric F series boasts its 16-megapixel front facing camera, the first in the industry. The Hi-Light Camera promises to capture clear and vivid photos in any lighting condition or four times less noise from the existing one. "Selfies will always turn out bright and clear no matter the time of the day because of the F1 Plus' unique technology and wide f/2.0 aperture lens," OPPO's product expert Marton Barcza said. 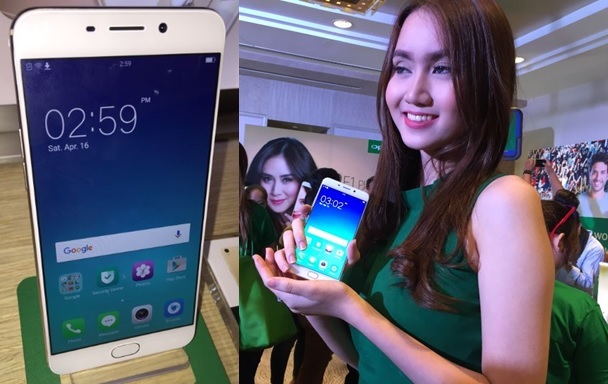 OPPO's product expert Marton Barcza officially unveiled OPPO F1 Plus. Among the new features of the F1 Plus are extra-wide 120-degree shots for the 'Selfie Panorama,' enhanced built-in beautification app Beautify 4.0 and front-facing flash. Brand ambassador and Popstar Princess Sarah Geronimo, who graced the event said these camera features will let the O-Fans "get the perfect shot on the first snap, anytime and everywhere." OPPO Philippines brand ambassador Sarah Geronimo. File Photo. The new flagship device has 5.5-inch AMOLED display and ultra-thin 1.66-mm bezels. The Chinese electronics manufacturer has said it mastered the perfect design as users won't worry about this phone slipping from their hands. OPPO F1 Plus, the better and bigger "Selfie Expert." File Photo. F1 Plus' Comfort Grip helps keep the phone safe in users' hands. File Photo. OPPO F1 Plus has ultra-thin 1.66 mm bezels. File Photo. Not only good for taking selfies, F1 Plus is powered by 4GB RAM and 8-core processor for faster and smoother experience. It's VOOC Flash Charge requires only 30 minutes of charging for its battery to reach 75-percent level. OPPO product expert Marton Barcza discussed the VOOC Flash Charge feature of F1 Plus. File Photo. The device also uses the updated ColorOS 3.0 for the increased speed (25% faster compared to ColorOS 2.1) and efficiency. More than that, OPPO now integrated the fingerprint recognition technology for faster (just 0.2 seconds) and easier unlocking of the F1 Plus. OPPO Philippines said the new device will retail for P21,990 and now available for pre-order nationwide until April 29. You just need to give downpayment of P 1,000 and you will get free selfie stick as you get the device starting April 30. F1 Plus also available on credit card payment, for 0% interest (6 months and 12 months).